The Republic of Cyprus is an island country located in the eastern Mediterranean to the South of Turkey. Geographically, it is part of Asia, but culturally it has many links to Europe. The two main ethnic communities in Cyprus are Greeks and Turkish Cypriots. When violence broke out between the two communities 1974, followed by an attempted coup d'état support by the military junta that ruled Greece at the time, Turkey invaded and occupied the northern part of the island (approximately one third of the country's land area). This part of island subsequently made a unilaterial declaration of independence, calling itself the "Turkish Republic of North Cyprus", but very few countries recognized it as an independent state. Today the island remains divided (although the Republic of Cyprus of course claims sovereignty over the whole island), and a UN demilitarized zone (the "Green Line") separate the two parts of Cyprus. 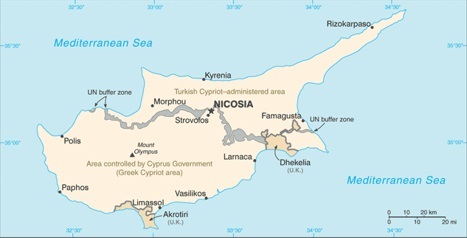 Additionally, Cyprus is home to two smaller areas (Akrotiri and Dhekelia), known as the Sovereign Base Areas, which are under British sovereignty. The total population of Cyprus as of 2006, was estimated as 855,000. More than a third of the population, 309,500, live in the vicinity of the national capital, Nicosia. The Cypriot economy is modern and developed, and principally based around services, tourism, and light manufacturing (the Turkish occupied parts of the island are however less developed economically). The offshore business sector is a particularly important of the economy. It is also worth nothing that Cyprus is now a member of the European Union, and has joined the eurozone, and has replaced its historical currency, the Cypriot Pound, with the euro.